“He’s the Last Word.” Lyrics by Gus Kahn, music by Walter Donaldson (1926). 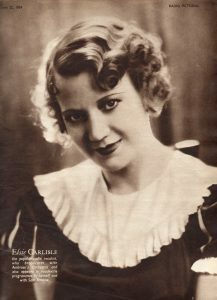 Recorded by Elsie Carlisle with piano and violin accompaniment at Studio B, Hayes, Middlesex, on May 6, 1927. HMV B. 2579 mx. Bb10689-2. Richard Johnson recognizes Arthur Young as the pianist on the other side of the record (“What’s the Use of Crying”), but that side was recorded over three months later. It is possible that Melody Maker‘s reviewer was unaware that the two sides had been recorded so far apart and simply assumed that the piano accompaniments were played by the same man at a single session. The suggestion that the violinist is Rignold is interesting. Hugo Rignold was already famous for his exceedingly “jazzy” playing, and certainly the violinist in “He’s the Last Word” gives the impression of being lively and unconventional — he almost saws at his instrument on occasion. Other noteworthy early versions of “He’s the Last Word” include ones by Art Kahn and His Orchestra, Jack Pettis and His Band (with vocalist Billy Hillpot), Ben Pollack and His Californians (with the Williams Sisters), Ben Bernie and His Roosevelt Orchestra (with vocals by Scrappy Lambert), the Broadway Bellhops (with singer Irving Kaufman), Jane Gray, Vaughn de Leath (recording as “Gertrude Dwyer”), The Troubadors, Annette Hanshaw (with Irving Brodsky on the piano), and Jack Linx and His Birmingham Society Serenaders. American Josephine Baker recorded “He’s the Last Word” in Paris accompanied by Jacob’s Jazz, and in August 1927 the Merl Twins (“Syncopating Songsters”) sang it in an early Hollywood Vitaphone short film. 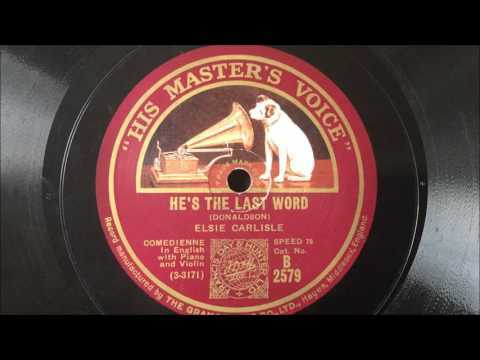 In Britain in 1927, in addition to Elsie Carlisle’s, there were versions of “He’s the Last Word” by The Savoy Orpheans (directed by Carroll Gibbons), Syd Roy’s Lyricals, and Bert Firman’s Dance Orchestra (as Eugene Brockman’s Dance Orchestra).